1 Departamento de Botánica, Instituto de Biología, Universidad Nacional Autónoma de México, Apartado postal 70-233, 04510 México, D. F., México. * mrrm.unam@yahoo.com.mx. 2 Posgrado en Ciencias Biológicas, Instituto de Biología, Universidad Nacional Autónoma de México, Apartado postal 70-233, 04510 México, D. F., México. Stramentopappus congestiflorus Redonda-Martínez and Villaseñor (Asteraceae: Vernonieae: Leiboldiinae) from Sierra de Juárez in Oaxaca, Mexico, is described and illustrated. It is distinguished from the other species of the genus by its tightly-clustered capitula forming glomerules and by fewer florets per capitulum. A key to the 2 species is provided. Key words: Bolanosa, Leiboldia, Compositae. Se describe e ilustra Stramentopappus congestiflorus Redonda-Martínez y Villaseñor (Asteraceae: Vernonieae: Leiboldiinae) de la sierra de Juárez en el estado de Oaxaca, México. Se diferencia de la otra especie del género por las cabezuelas agrupadas en glomérulos y la menor cantidad de flores por cabezuela. Se incluye una clave para las 2 especies del género. Palabras clave: Bolanosa, Leiboldia, Compositae. Stramentopappus H. Rob. and V.A. Funk is distinguished from other genera in the tribe Vernonieae (Asteraceae) by the occurrence of a conspicuous callous at the achene's apex and by its short (less than a third of the corolla's length) multiseriate straw-yellow pappus located on the outside of the apical callous. It was described as a monotypic genus, closely related to Leiboldia Schltdl. ex Gleason, and Lepidonia S.F. Blake (Robinson and Funk, 1987). It is reported from the northern mountains of the state of Oaxaca, locally referred to as Sierra de Juárez. Stramentopappus is placed in subtribe Leiboldiinae H. Rob., along with Bolanosa A. Gray, Leiboldia, and Lepidonia (Keeley and Robinson, 2009). These 4 genera share several characters that support recognizing the subtribe Leiboldiinae as a monophyletic group; among them are the synflorescences composed of few heads with many florets, 4 or 5 ribbed achenes, the usually deciduous pappus, and a chromosome number n= 19. Despite their shared characters, each genus shows particular distinguishing features; Bolanosa is characterized by a paleaceous receptacle (like the type of Lepidonia) and sericeous achenes; Leiboldia has white-tomentose stems, lower leaf surfaces and phyllaries, and the capitula are closely grouped in glomerules surrounded by elliptic-ovate bracts (this last character is shared with Bolanosa). Finally, Lepidonia can be distinguished by the velutinous (rarely white tomentose) foliar pubescence, and the phyllaries with apical appendages. 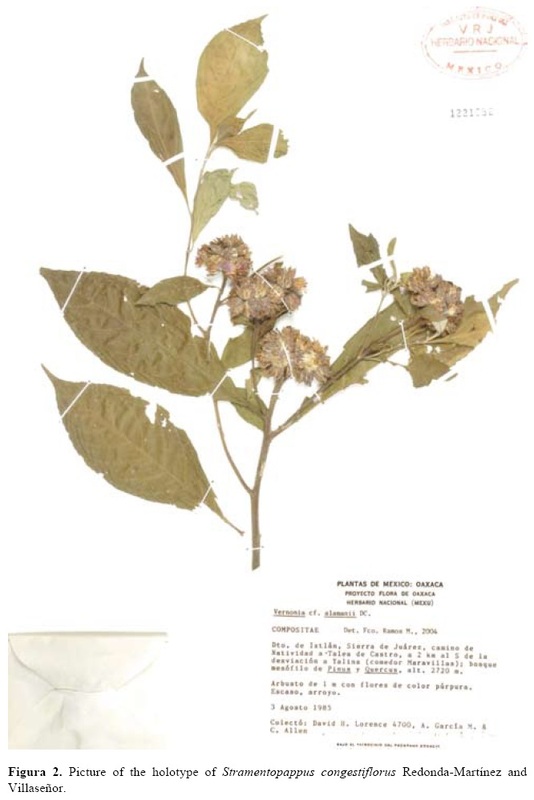 Several undetermined or misidentified specimens studied during the revision of herbarium specimens of subtribe Leiboldiinae in several Mexican and foreign herbaria, represent a new species in the genus Stramentopappus, differing from the only known species Stramentopappus pooleae (B.L. Turner) H. Rob. and V.A. Funk, by their capitula clustered in sessile glomerules or on very short peduncles (vs. conspicuously pedunculate heads in few-headed coymbs), fewer florets per capitulum (vs. more than 100 florets per capitulum) and oblong phyllaries (vs. subulate). Both species share the reduced, straw-yellow multiseriate pappus located outside the achene's apical callus, the latter less developed in the new taxon than in S. pooleae (Fig. 1). Other characters in common are the tomentulose pubescence of leaves and young branches, the triangular apical anther appendages, and the numerous lenticels on branches and stems. Finally, the known geographical distribution of both taxa is limited to a few localities in the mountains of northern Oaxaca. Herbarium specimens of the subtribe Leiboldiinae housed in several Mexican herbaria were revised, especially those at MEXU, FCME, IEB (Thiers, 2013). Several specimens of the new taxon were identified as Stramentoppappus pooleae, Vernonia alamanii DC., and Vernonia karviskiana DC. subsp. inuloides (DC.) S. B. Jones. In order to evaluate the taxonomic circumscription of the new taxon and other closely related taxa, a multivariate analysis was carried out. Specimens of Stramentopappus pooleae, Bolanosa coulteri A. Gray, and Leiboldia with which this new taxon could be confused were included in the analysis. 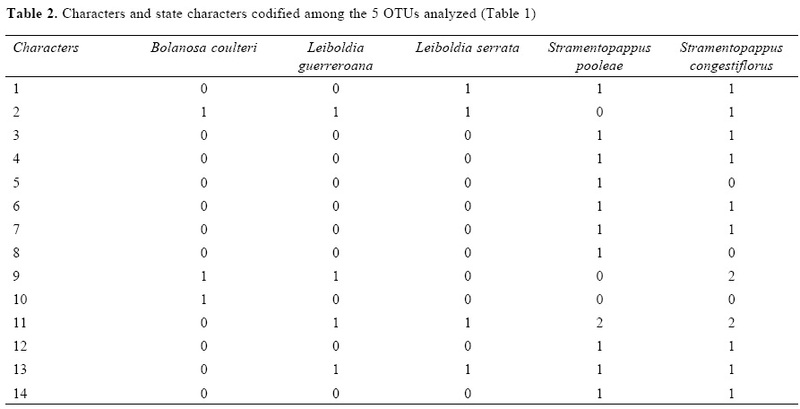 Morphological similarity was assessed among 5 taxa (OTUs) comparing 14 morphological characters (Table 1) mostly codified as presence-absence (Table 2). The clustering analysis was obtained through the use of Manhattan distances coefficient and the UPGMA procedure. In addition, a principal coordinate analysis using the same data matrix (Table 2) was accomplished. All these analyses were carried out using the Ntsys 2.02i program (Rohlf, 1998). Stramentopappus congestiflorus Redonda-Martínez and Villaseñor, sp. nov. Type: Oaxaca, Mexico. Distrito de Ixtlán. Municipio de Santiago Laxopa: sierra de Juárez, camino de Natividad a Talea, 2.5 km al S de la desviación a Yalina (Comedor Maravillas) 17°15'25" N, 96°19'03" O, 2 700 m, 3 ago 1985, D. H. Lorence 4700 (Holotype: MEXU). Fig. 2. Differt a S. pooleae capitulis in glomerulis aggretatis et flosculis per capitulum minus numerosis. Shrubs or subshrubs 1.5-2.0 m tall. Stems striate, tomentulose or glabrescent, with numerous lenticels. Leaves alternate, petioles 0.8-1.2 cm long, blades elliptic-ovate, 8.0-13.0 cm long, 3.0-5.0 cm wide, both surfaces bearing with short stipitate-glandular hairs, the abaxial surface tomentulose when young, glabrescent with age; leaf base acute, sometimes decurrent along petiole, apex apiculate, margins serrate. Capitula 12-20, homogamous, discoid, sessile forming glomerules or short pedunculate, peduncles 1.0-3.0 mm long; involucre campanulate, 11.0-13.0 mm long, 8.0-11.0 mm wide; phyllaries 6 or 7 seriate, graduate, oblong-lanceolate, apices obtuse-mucronate, tomentulose-glandular or glabrescent with age, outer series 5.0-6.0 mm long, 3.0-3.5 mm, inner series 8.0-10.0 mm long, 2.0-3.0 mm wide. Florets 20-30 per capitulum, corollas purple, actinomorpic; 7.0-12.0 mm long, tube 4.0-8.0 mm long, lobes 3.0-4.0 mm long, provided with short stipitate-glandular hairs, throat poorly defined; anthers 3.0-4.0 mm long, glabrous, apical anther appendages triangular, base sagittate; style branches elongate, acute, pilose, 2.0-3.0 mm long. Achenes obovate (Fig. 3), glabrous, 4 or 5 ribbed, 2.0-3.0 mm long; pappus setae capillary, multiseriate, deciduous, 3.0-5.0 mm long. Pollen 40.0-50.0 μm diameter, subechinolophate, tricolporate, with perforated tectum (Fig. 4). Distribution: endemic of the state of Oaxaca, at present only known from Sierra de Juárez in northern Oaxaca, District of Ixtlán (Fig. 5). It is difficult to clearly establish the conservation status due to the environmental policies implemented by inhabitants of the region, difficult access to the area of distribution and lack of floristic knowledge of the area. Phenology: flowers and fruits from May to September. Habitat: pine oak and humid mountain forests, at elevations between 2 300-2 850 m, and generally associated with species of Meliosma Blume (Sabiaceae), Ocotea Aubl. (Lauraceae), Persea Mill. (Lauraceae), and Prunus L. (Rosaceae). Etymology: the specific epithet alludes to the capitula aggregated into glomerules. Additional material examined: Oaxaca. Distrito de Ixtlán. Municipio de Capulalpan de Méndez: NE del río Natividad 17°18'20" N, 96°22'35" O, 2 370 m, 27 sep 2002, S. Figueroa y F. Y. Guzmán 289 (FCME, MEXU); 7 sep 2003, S. Figueroa y F. Y. Guzmán 671 (MEXU). Municipio de Santa María Yalina: sierra de Juárez, camino de Capulalpan a Talea, 2.5 km al N de la desviación a Yalina 17°16'25" N, 96°18'29" O, 2 850 m, 31 may 1983, D. H. Lorence 4221 (MEXU). Municipio de San Miguel Yotao: sierra Norte, 4 km al SO de Yotao, alrededores de Llano Machín camino a Capulalpan, 17°21'47" N, 96°22'05"
O, 2 300 m, 17 jun 1997, S. Acosta 2799 (IEB, MEXU). Key to the species of the genus Stramentopappus. Remarks. Stramentopappus congestiflorus could be confused with B. coulteri or Leiboldia spp. based on the capitula clustered in glomerules. 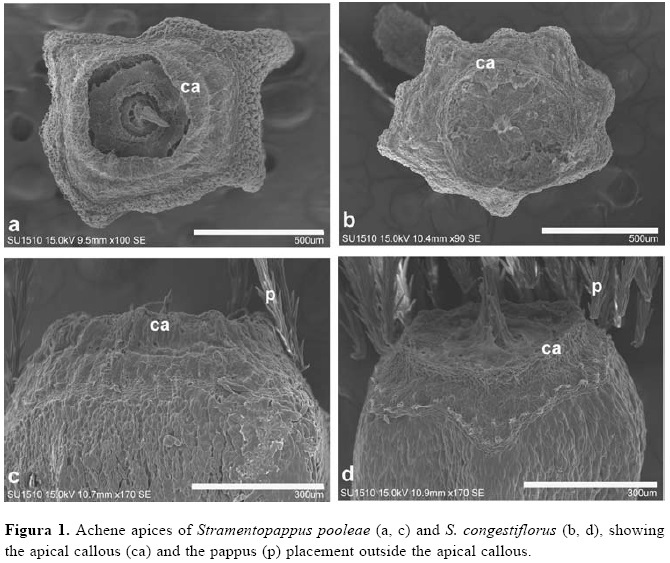 However, the lack of bracts surrounding the glomerules distinguishes Stramentopappus from the 2 latter genera. Additionally, this new species also lacks the white-tomentose pubescence on the mature branches, the leaf undersurface, and the phyllaries which are characteristic of Bolanosa and Leiboldia. The straw-yellow multiseriate pappus and the geographical distribution of this new species also help separate these taxa. 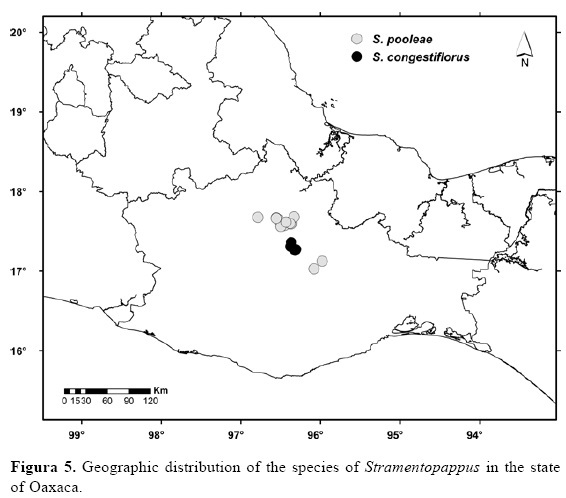 Stramentopappus congestiflorus is only known from 5 collections from the District of Ixtlán; S. pooleae has a wider distribution, including the districts of Choapan, Cuicatlán, Ixtlán, Mixe, and Tuxtepec (Fig. 5). Leiboldia does not occur in the sierra de Juárez (Oaxaca) where Stramentoppapus is found, and similarly, Bolanosa is more widely distributed and is found in west-central Mexico in the states of Guanajuato, Jalisco, Michoacán, and Zacatecas; Leiboldia is found mostly in the mountains of eastern and southern Mexico in the states of Hidalgo, Oaxaca, Querétaro, Puebla and Veracruz. Multivariate analysis. The clustering analysis is summarized in the phenogram illustrated in figure 6. Two main groups can be observed, the first is formed by B. coulteri and Leiboldia (including L. guerreroana (S.B. Jones) H. Rob. and L. serrata (D. Don) Gleason) and the second by the 2 species of Stramentopappus. 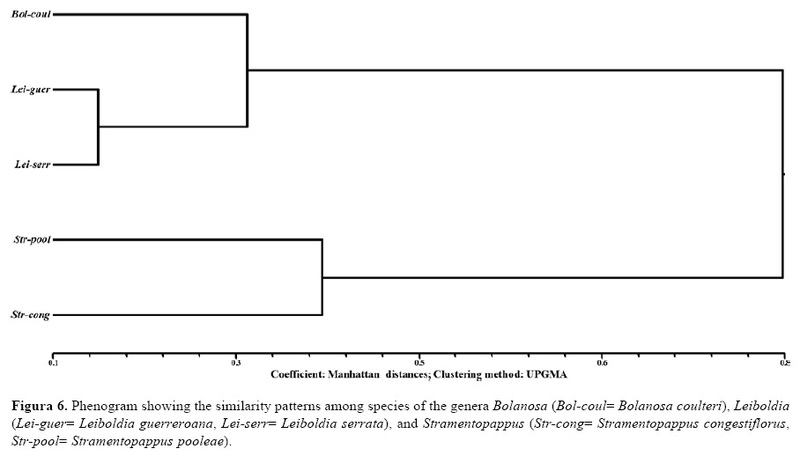 The ordination analysis also resulted in a similar distinction among taxa as that observed in the clustering analysis (Fig. 7). 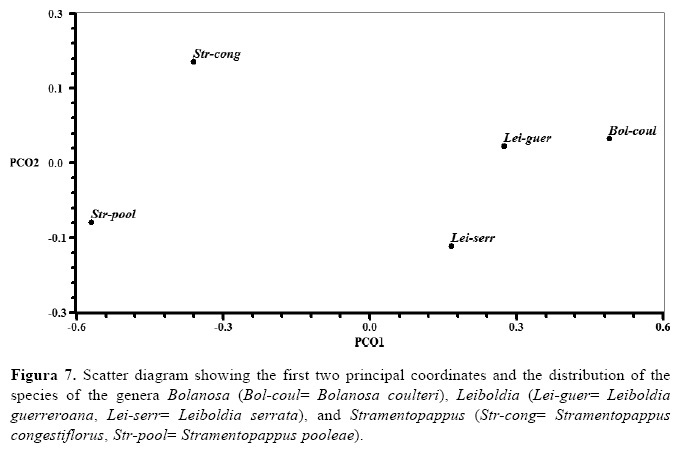 The first principal coordinate clearly separates the species of Stramentopappus from the species in other genera. The loading values of the main characters in each coordinate are given in table 3. Results of these analyses further support the conclusion that there is a new taxon and its proper placement is in the genus Stramentopappus. The first author would like to thank the Posgrado en Ciencias Biológicas, UNAM and Conacyt for support (grant 263523) to carry out graduate studies in the Botany Department, Instituto de Biología. Claudio Delgadillo, Rosaura Grether, Rosalinda Medina and Fernando Chiang revised the manuscript and made important suggestions to improve it. Also to the anonymous referees that have helped to improve the text. María del Rosario García-Peña helped with the management of type material and Berenit Mendoza-Garfias, assisted with the use of the scanning electronic microscope and sample pictures. We thank the curators of the cited herbaria for the facilities provided to review the material.